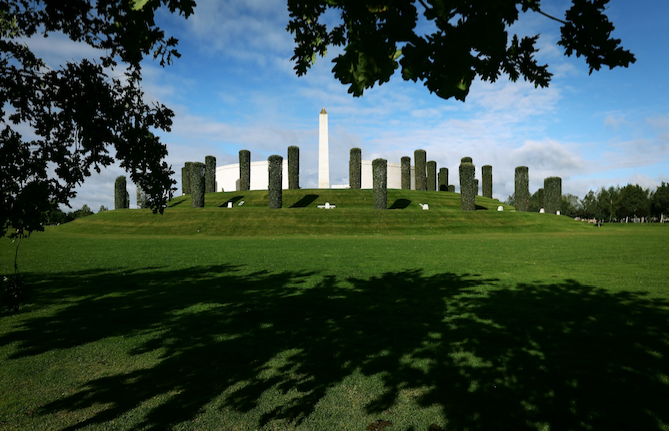 A decade after the Armed Forces Memorial was dedicated in the presence of Her Majesty The Queen at the National Memorial Arboretum in Staffordshire on 12 October 2007, the pyramidal holm oaks supplied by Barcham Trees to encircle it are now clipped into majestic circular columns. They stand sentinel at this nationally significant focal point for remembrance, honouring members of the Armed Forces killed on duty or as a result of terrorism. Barcham's David Johnson commented "It seems incredible it is now ten years since the holm oaks were planted, and we are delighted they have proved worthy of their position in this important place. Even while they were still on the nursery in their formative years, they formed a dramatic feature, impressing many of our visitors". Liam O’Connor, the architect for the project and designer of the landscape setting, and David Johnson selected more than 50 trees individually before they underwent a rigorous cultural programme on the Cambridgeshire nursery to meet Mr O’Connor’s specifications. He also produced a drawing during the memorial's construction to show how the maturing trees should be pruned during their first decade in situ. The National Memorial Arboretum (www.thenma.org.uk) is situated in Alrewas, Staffordshire (use DE13 7AR for satellite navigation), close to all Midlands motorways. It is an evolving woodland landscape, featuring 30,000 trees and more than 350 memorials. The 150-acre site serves as a living tribute to those who have served and continue to serve the United Kingdom.